Okay. I set out to write a post about bacon-cheddar stuffed burgers, with some chips on the side, and I ended up waxing eloquent about the crisps. Don’t get me wrong; the burgers are very, very good. They’re not fancy, but they don’t need to be (despite the fancy-pants staging above with the avocado slices). They are straightforward, tasty burgers. Also, mine are bunless, but that’s because I, uh, didn’t want to leave the house to buy buns. Yours can absolutely have buns. But chips. I have a thing about chips. I also have a thing for chocolate, but I have to be honest – over the past decade or so, my tastes have gradually shifted. I’m pretty good about walking past the candy aisle in the grocery store, but chips? Crunchy + salty + fried is my weakness. These crisps are my answer. 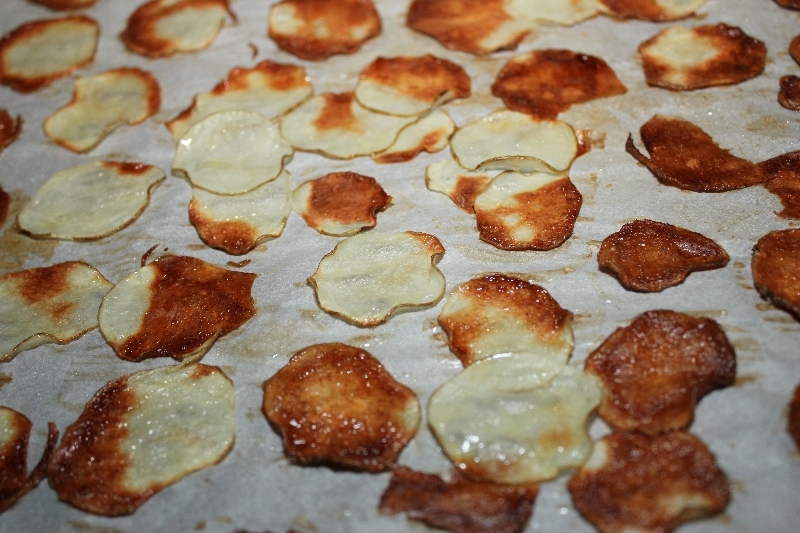 I’m calling them “homemade crisps” instead of “chips” because they’re not quite like the fried-air chips you buy in bags, but they sure are crispy. They’re also healthier by definition, simply because they’re made from real potatoes, by you, right now (as opposed to deep fried and then put on a shelf for however long). The ones in the photos here got cooked for a bit longer; Robby liked them best that way. I actually preferred them cooked a little bit less, so you get just a touch of chewy potato. They are not pictured here because I ate them all. I dug out my mandoline from under some decorative tea towels for the express purpose of making a thinner, crispier crisp. I had only used it once before because it didn’t come with the handguard and I’ve been nervous about slicing my fingertips off. But I tried these chips earlier in the same week, slicing with a knife, and it’s just much easier with the mandoline. It was easy enough that I might, in experimenting with these in the time before Robby got home, have eaten three pans of them by myself. See above about eating the photography material. I encourage you to eat these right out of the pan, hot, with plenty of salt. If you want to get really fancy, you could top them with bleu cheese and maybe a honey drizzle. Ooooooh. 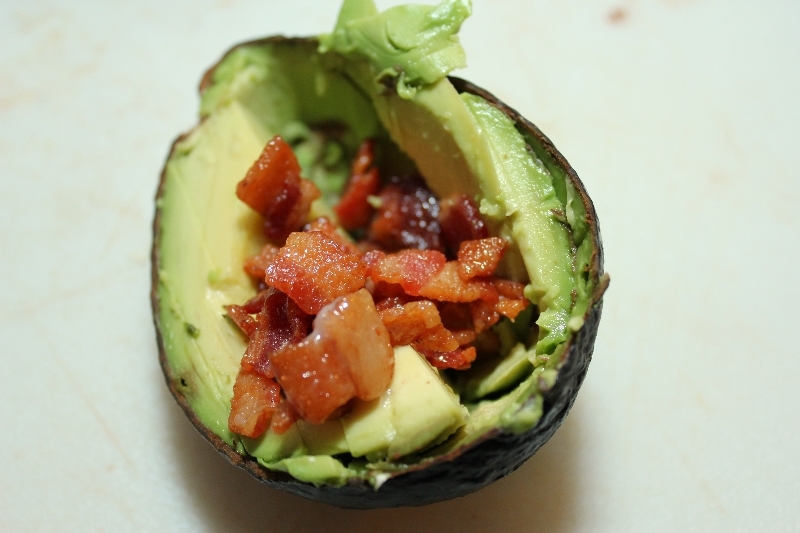 Also, if your fancy-burger photography leaves you with part of an avocado and some extra bacon…I advise you to get a spoon. 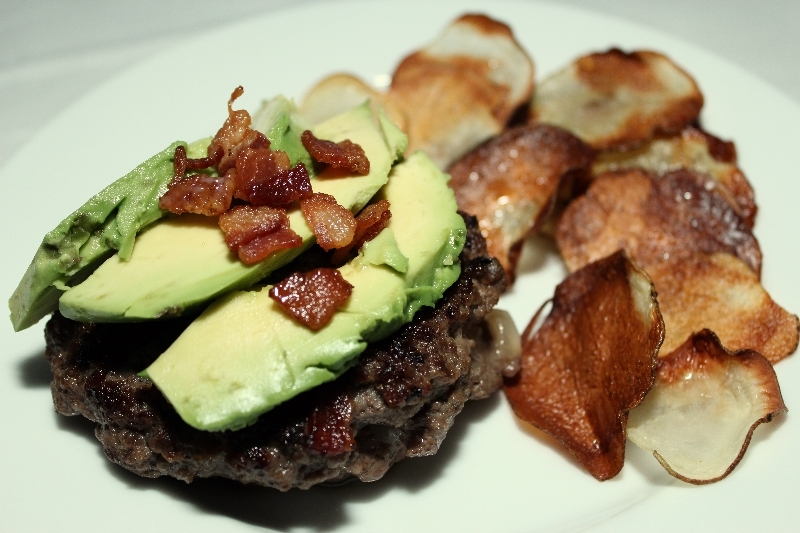 These are simple, delicious burgers with simple, delicious crisps. Have them with or without buns and toppings of your choice. Make extra crisps; you won't regret it. Cook bacon over medium heat until crisp; remove to a medium mixing bowl. Cooking it at a lower heat takes longer, but more of the fat renders out so that the pieces cook more evenly and crispier. Drain most of the bacon grease, leaving a teaspoon or so in the pan. Sauté onions until soft, about 5 minutes. Stir bacon, onions, and cheese together. It's okay if the cheese melts a bit; that will make the filling easier to handle. For the burger outsides, season ground beef with lots of salt and pepper, more than you think you need, and the garlic. Test the flavors by sauteeing a little piece; add more salt and pepper as necessary. To build burgers, divide burger meat into eight. Form each section into a thin patty, about a quarter of an inch thick. Divide filling into four. Form a filling quarter into a ball and sandwich between two burger patties. Pinch the edges together to seal. You can carefully flatten them a little more at this point, pinching together any breaks. Grill, or cook on the stove on medium heat, about 3 minutes per side. Serve with toppings of your choice and lots and lots of fresh hot crisps. Preheat oven to 400 degrees. Cover a baking sheet with parchment paper. 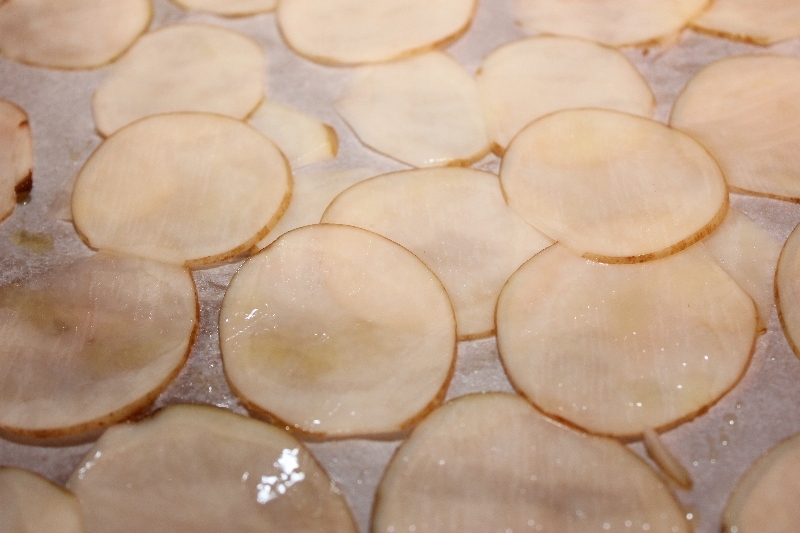 Use a mandoline or a knife to slice potatoes very very thin. Lay out on the baking sheet (I found that I could just squish one whole potato's worth of slices onto one baking sheet). Brush with olive oil and sprinkle liberally with salt. Bake for 8-12 minutes, checking often to achieve desired crispiness.